Well...I'm not known for my outdoorsey side. 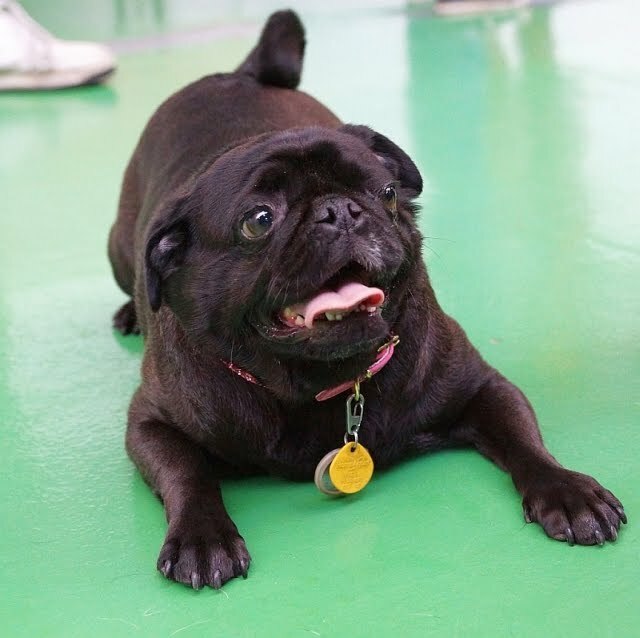 I'm more of a laid back city-pug who likes her neighborhood walks and trips to see my friends at the doggie parks. Mommy and Daddy were both home with me today...and said they have some plans for an outdoor adventure in the wilderness! I was a bitty bit scared but excited to try something new, and the day wasn't too hot, so I knew I could do all the walking and sniffing and eating (shhh....don't tell them) that I could handle. So it was off to a place called The Lafayette Resevoir! It was a short drive in Mommy's car, but I couldn't figure out why they both were sniffing and digging around the car grumbling about something called a "quarter?" Well, I guess they figured it out, and I was put in my cool buddy belt and we were off! I've never seen so much water! There's more water in here than in the bathtub when I get my baths! I tried to put on my best Pug brave face (I don't think I can swim)! Our walky-walk continued through the grass and trees. I even tried to chase a big animal that Daddy called a "Deer" But he was too fast. I asked Mommy to try and get a picture for my blog, but she was too slow and the deer ran away. My big adventure was so much fun! 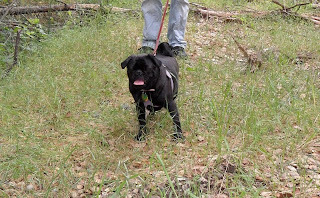 I could so be an outdoor adventure Pug! I was really tired after all the walking and chasing and sniffing, but it was so worth it! I'm gonna ask my best bud Spencer if he wants to come with us next time! That's very cool your people took you to explore the wild. The wild is a very fun place. 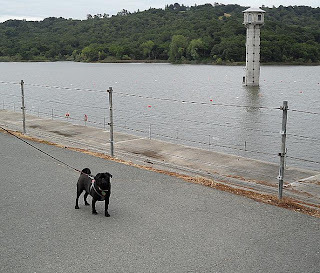 I went to a reservoir over there on your side of the bridge once. We went swimming - it was very cool. Are you sure you don't swim? It's superfun. We saw a deer today too! It bounced away BOING BOING BOING through the grass. 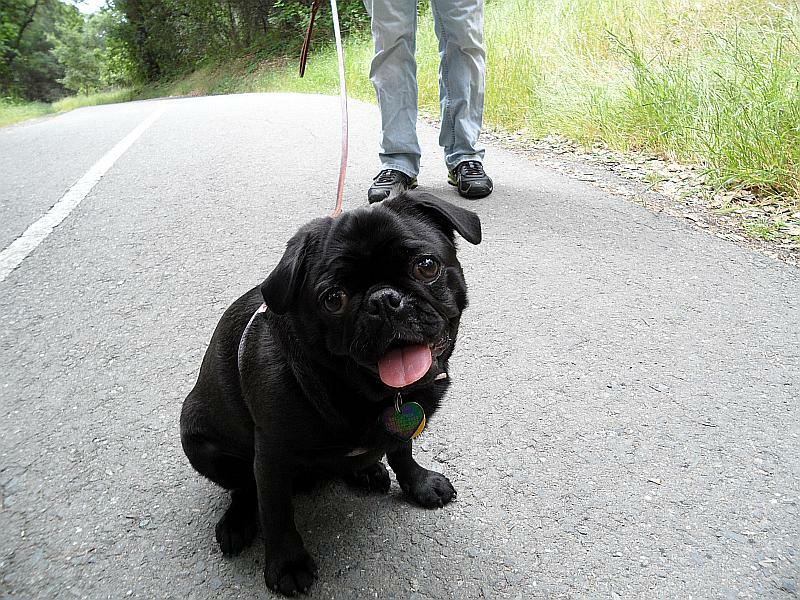 My little puggy legs had no chance. Even Dutch was too slow for the deer. PS: is that a waist I see, or one of those optical illusion thingys? Bellatrix! The outdoors are nice! I love hiking trips. Mama says she is gonna take me back packing soon. 6 miles in and 6 miles out for an over night. Not sure if I can make it but we are practicing. Glad you had fun. Have you ever been swimming? Puglet, mom bought me a little pool and it hasn't been hot enough to use it. I love to take a bath, so I might like swimming, I've just never tried. I might have to give it a try. I was a little afraid of the deer, but it ran away real fast. Oh well, maybe next time. 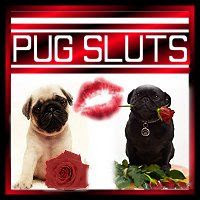 Oh Puglet I just saw your other comment...yes I do have a waist. Lots of play time with Spencer and not a lot of treats. I'm getting ready for bikini season. Holy frijoles Oliver..that is a long walk! I could never do that! 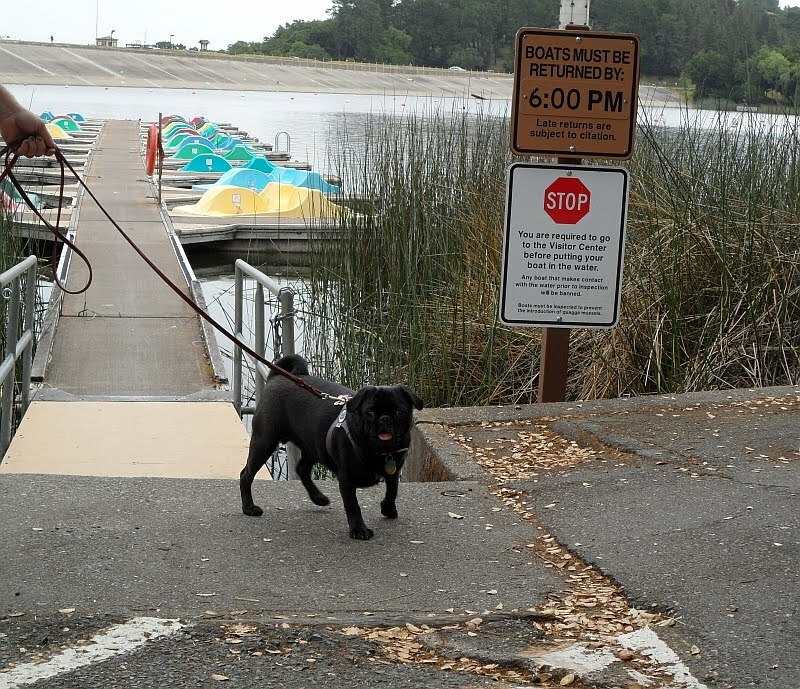 I didn't even do the whole walk around the reservoir, something about not enough quarters for the meter. Mom says we'll go back and do the whole thing! Thanks for asking me to join you at the dog park, but I don't think my mom would buy me a plane ticket, I'm in South Carolina and the round trip would be hard on me. Fun day. Great pictures. 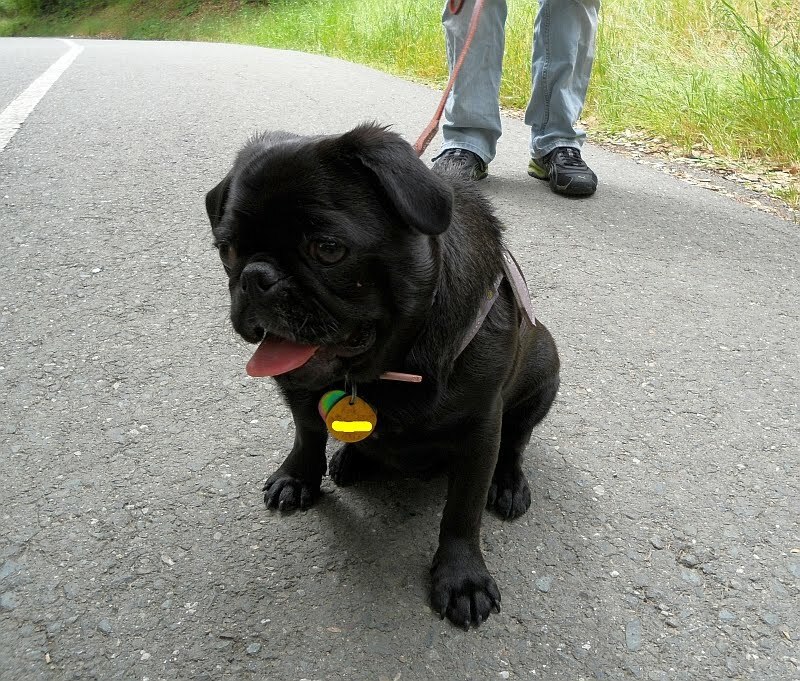 What a photogenic puggie you are. You go, cover girl! Just stay cool. The sun can be brutal for us black beauties, especially during the summer months. That's why we to stick to shady trails. Look forward to hearing about more of your adventures. When Anakin gets better I will send him over to play! We are thinking of you still and we wanted to stop by your little bloggy and say hi! If you like water, you'll probably like swimming. It's superfun. My human makes me wear this goofy floaty vest thing because she says pugs are "half an inch and one gulp away from drowning".